When your baby is between six months and two years of age, it’s likely that her receptive language skills, meaning the amount she understands, is more advanced than her expressive language skills by a mile. This means that your little one has an understanding of the world around her, but cannot communicate her needs. This can lead to meltdowns and frustration. Luckily, teaching her a bit of sign language at this age can help her to communicate her basic needs and wants. 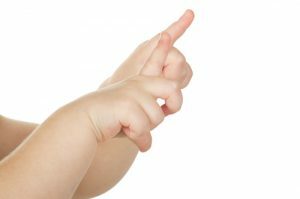 While most children don’t begin to come up with their first words until sometime between 12 and 18 months, and most cannot truly communicate their needs verbally until they reach 18 months, and often not until well after their 2nd birthdays, they do have the skills necessary to make rudimentary signs used in American Sign Language. Since children’s motor skills and receptive language develop earlier than their ability to speak out loud, teaching your child sign language can be a great resource for you both. Begin with the most important signs. While teaching your baby “duck”, “bath”, “cat”, and “I love you” might sound fun, start first with the signs that will allow your infant to actually express a need he frequently grows frustrated with. For instance, try signs such as “milk”, “more”, “all done”, “diaper”, and “bed”. We know one little boy whose ability to sign “more” practically eliminated all frustration-based meltdowns! You can teach your baby his first signs by performing the correct motions with your hands in close proximity to the object you’re signing about, or while verbalizing a statement such as “more” or “all done”. Repetition is key. Start with just a few signs, but repeat your signing every time you use the verbal words or come across the physical object throughout your day. Your baby, a natural mimic, will soon imitate your actions. Of course, reward your little one with praise, and fulfill her request if possible. If she signs for “milk”, provide her with positive feedback and some milk so that she will see that when she signs for something, she will receive what she needs. This is a true motivator, and will ensure that she continues to sign in the future. Speak with your daycare provider as well, to let them know which signs you and your baby are using to communicate, so that the teachers at your childcare center can communicate with your child this way as well. Did baby sign language work well for your family? Which signs did your child utilize the most? Let us know in the comments section!